Price: Android free, with IAPs; iOS $0.99, with IAPs. 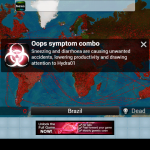 Plague Inc. must be a hidden test for sociopath disorders conducted by the government, and if so, millions of people enjoying this simulator are as good as sick. Truth be told, clearing out humanity from the face of the earth is a surprisingly addictive and enjoyable experience, but also creepy. You play as an ingenious but evil mind behind the scenes, creating a deadly disease in your lab. You have to choose a country for your zero patient, spread the disease so that the world doesn’t notice it, evolve the pathogen and kill the human kind. When people realize they deal with a deadly pandemic, they will start investing huge money in the cure research, and you will have to be in their way by mutating the pathogen’s DNA, evolving its deadly symptoms. Brutal – for when you want to put you strategy skills to test, when people are obliged to wash hands, researchers literally live in their lab facilities of closed types, and sick people get locked in prison. The very stance of the game is apocalyptic, which makes every discovery you make even creepier. 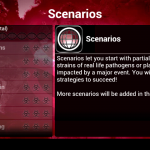 If you have a look at the number of scenarios you can unlock via in-app purchases, you will see immediately which movies or real events inspired the developers to create custom scenarios. There are a few sci-fi scenarios, such as Mirror Earth, but also some very probable ones like Global Warming, Xenophobia, Artificial Organs and Who Cares, where people in developed countries are so brainwashed by reality shows and Hollywood vanity fair, they just don’t care when poorer countries worldwide get struck by pandemic. Symptoms – how your disease manifests itself (from mild coughing and fever to total organ failure, leukemia, cysts and a large variety of disgusting stuff). Some pathogens can mutate on their own, so you will have to keep an eye on development of serious symptoms that will make people aware of the disease before it has spread enough. Abilities – how hard it is to discover, reproduce in a lab, find a cure and kill the pathogen. You will upgrade the resistance of your pathogen to the severe weather conditions, antibiotics, and evolve its DNA structure to make it extremely hard for the researchers to reproduce and analyze, which will effectively make cure research very slow and ineffective. Before you even start, you have to think carefully which country would be the first to get infected, and there are a number of factors here that determine how you proceed. For example, you can choose a poor country, where the government will not invest in the cure research, but the poor countries’ citizens do not travel much, so by the time the poor country starts dying out of pandemic, the rest of the world will have known of the pandemic and will not have enough people infected by the time the developed countries’ governments find the cure. Likewise, if you start with Europe or USA, you need to keep a low profile not to have your disease noticed by governments. On the other hand, citizens of rich countries travel worldwide and spread the plague very fast. 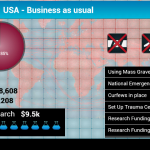 I found that some of my most successful pandemic experiments started in the U.S., with a harmless thing that first spread fast, and then developed high resistance and deadly symptoms killing the humans that only started suspecting something. 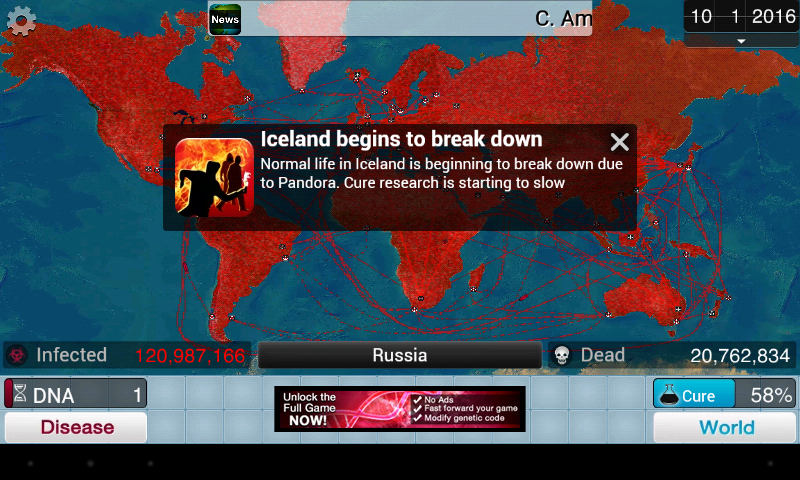 You get DNA points when your plague infects people in other countries. At first, you will have to be patient and wait for those slow ticking DNA points to accumulate, so that you can spend them on Transmission, Symptoms or Abilities upgrades. However, there is a point in each game when the points tick fast, and you feel like you’re on a shopping spree. But be wise, because once the infection spreads all over the world, DNA points will accumulate slowly again. In this respect, the middle stages of the game are the richest in points, and it is during this stage that you have to upgrade Abilities and Symptoms, assuming you’ve been working on Transmission during the initial stages. 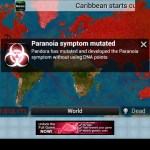 However, there are intricacies to each of the pathogen’s mutation, so each type requires a different approach, and that offers a great replay value. Mutations are the scariest part – nausea and vomiting is nothing compared to rectal bleeding, cysts, insomnia, brain damage and, as a result, paranoia or the zombie effect, when sick people become either aggressive, or sleep walk. Borders are shut down, infrastructures are destroyed, governments collapse and humans fall into panic and chaos, making the cure research impossible. 28 Days Later, The Walking Dead, The Carriers, and a great multitude of more or less known movies will keep playing in your head as you read the stats in your dashboard. 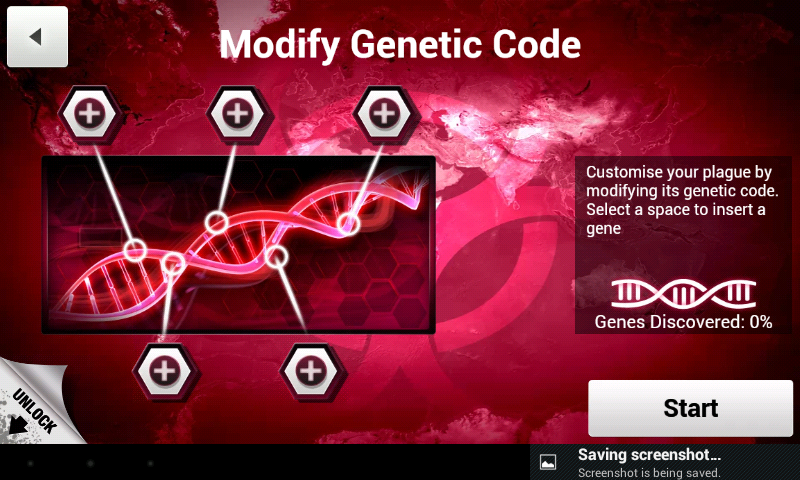 With or without resorting to IAPs, you can play, enjoy and kill the world of humans, but if you pay, you will be able to deploy mutations and various DNA changes even before you infect your zero patient. Also, the Scenarios and the cool perks, such as the update that ties into the Dawn of the Planet of the Apes movie release are available via in-app purchases that cost $1.99, and it’s well worth buying. The Simian Flu gives rise to the intelligent apes who eventually grow into a civilization of their own, extinguishing human race. You can grow the pathogen to get transmitted from ape to ape, then have your apes attack research facilities and slow down the works on the cure. Also, you can control the apes and help them hide from military drones until they are strong enough to take over the planet. It is not a con per se, but there is something deeply sadistic and I dare say prophetic about it. 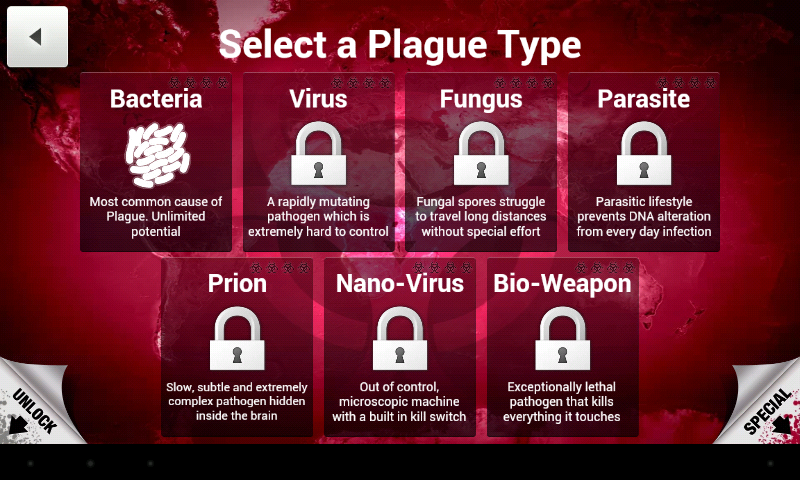 If you wonder what it feels like to be the last person on earth, Plague Inc. does a great job creating the atmosphere of human extinction. An occasional child’s cough, or a woman’s cry is all you ever hear in the game, but for a very creepy girl’s voice singing “Ashes, ashes, we all fall down.” You will see graphs, charts, and a Death’s dashboard as you work on your own plague designed to put an end to civilization of homo sapiens. Many a wise men say humans are a plague killing this planet, and this game basically illustrates how easy it is to wipe us out in a matter of a year or two. 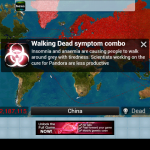 Modern science has enough artificially produced pathogens to extinguish the 7 bln of us several times, and somehow, after having killed the humanity several times in the game, you will find yourself silently praying for it to never happen in real life. As far as the game is concerned, it’s polished, meticulously thought-through and crafted with great talent, which made it a wickedly addictive and evil pleasure you wouldn’t want to put down. 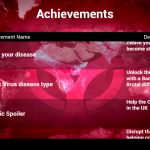 Plague Inc. is polished, meticulously thought-through and crafted with great talent, which made it wickedly addictive and an evil pleasure you wouldn't want to refuse.